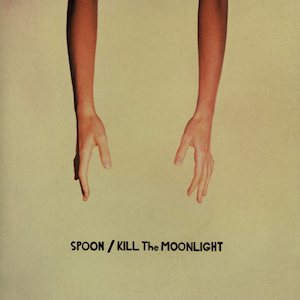 Listen to this track by Austin Texas rock auteurs Spoon. It’s “Jonathon Fisk”, a single from their critically-acclaimed 2002 record Kill The Moonlight, their fourth. The album would place them on track to be one of the most consistently great bands of the 2000s, establishing an artistic trajectory and momentum they continue to create for themselves today. The record would make all kinds of best-of lists across the music press. The song is a childhood recollection by singer, guitarist, and writer Britt Daniel of being bullied by the titular figure; a kid who talks with his fists, and counts the narrator’s teeth every night. But, this is no act of revenge, the result of a songwriter lashing out through his art. It goes deeper than that, back into the primal fear of what it feels like to be persecuted by a school bully when you’re a kid, and to realize you’re still carrying it with you. But, this being Spoon, the whole drama unfolds using the most basic of tools, and to the most precise effects. One of the things that makes Spoon’s music so potent is how spare it is, how little their emphasis is on filing every gap and in fact using those gaps to push their music to new areas. Their music has holes in it on purpose. In many ways this works against the idea that rock bands have to be “tight” in order to be good, that a groove always has to be given away, all packaged up. Here, the result is a more impressionistic take on rock ‘n’ roll music, which despite their innovation in terms of their approach to arrangement, is what this band has made here. That impressionistic take serves this song particularly well, given that this song is about fear and about being made to feel helpless by an assailant; that walk home from school can seem like a very long one to a kid. In this case, it’s also about the idea that even when we’re adults, being successful and otherwise well-adjusted, those primal childhood experiences can still reach us no matter how much success we’ve achieved in our adulthood. We can move on from them, but the memories of them often still cling to us. “Jonathan Fisk” we tried about four different ways. It originally started out as an acoustic song, on acoustic guitar, and after trying it all these different ways and not really feeling that it worked, I finally was just like, “We should do this one live in a room.” The way we talked about it was garage rock. I don’t know if it sounds garage rock but…yeah, we recorded that one in one room, live. You can hear the engineer– we had done about 13 takes– trying to psyche us up. (read the whole article). It’s kind of appropriate that this song took some work to get to. When delving into one’s past, and exposing raw nerves, bringing it all to the surface was never going to be easy. Atom bombs and blunt razors all around. And given that this is an autobiographical song, what of the ominous, thick-necked, right-wing bully at the center of this story? Well evidently, he became a fan of the band. If we’ve moved on, clinging memories notwithstanding, so often have our tormentors, making us wonder if they even remember how they shaped our lives. In some ways, that makes dealing with memories and feelings left over from the past worse, not better. That’s why this song is so resonant beyond the specific experience of its author. But as for Britt Daniel, maybe taking the kid who persecuted you in middle school and making him love your band as an adult, especially when the reason he bullied you is because he thought your taste in music was wimpy, is the best possible resolution for a songwriter. Find out more about Spoon at spoontheband.com.